Russian people are interested in better relations with foreign nations, but the country will never succumb to pressure from abroad or follow imposed policies, Communist leader Gennadiy Zyuganov said during talks with US Ambassador John Tefft. “Russian society has the good intention to strengthen the relations with both East and West, but we will no longer allow anyone to torment us. This is our principled stand,” the leader of the Russian Communist party was quoted as saying by RIA Novosti. Zyuganov also told the US diplomat that Russia would never have its own “Maidan,” adding that the plans to install anti-corruption blogger turned opposition politician Aleksey Navalny as the Russian leader are doomed to fail. The politician also compared Navalny to a young Boris Yeltsin and noted that the only difference between the two figures was that the former remained sober. Russian people have had a good vaccination against “Yeltsinism,” the Communist leader said. The Russian politician expressed his indignation over the fact that the United States played a role in the current crisis in Europe. He noted that if the situation persists “the worst times of the Cold War” could return. 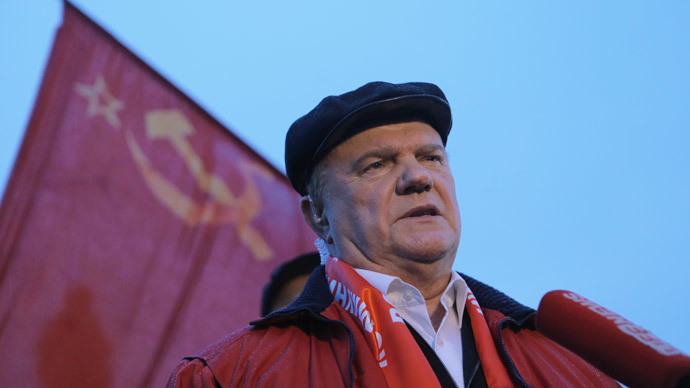 Another issue of primary concern was the surge of neo-Nazi sentiments in the region, especially in Ukraine, Zyuganov noted. Tefft was appointed US Ambassador to Moscow in 2014. Before that he worked in in Georgia and Ukraine and his stay in these countries coincided with major troubles. Tefft was Ambassador to Georgia in 2008 when Georgian troops attacked South Ossetia, leading to a brief war with Russian involvement. He also left the post of ambassador in Kiev shortly before the Maidan protests of 2013, which led to the deposing of democratically-elected President Viktor Yanukovich and eventually to the full-scale war between the pro-Kiev military and federalist militia in the southeast of the country.